Here's what we can tell from Overwatch's moon base teases - UPDATE: New map confirmed! Overwatch could be teasing its first ever extraterrestrial map and a new hero, too. 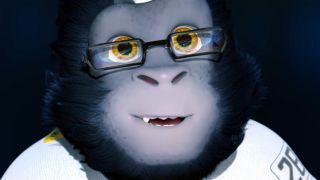 Blizzard posted a series of in-fiction messages showing communications from Horizon Lunar Colony, the moon base that we last saw in the Recall animated short as the childhood home of scientist ape Winston. Even better, several teases have been spotted for another uplifted primate named Hammond, who may be the next addition to the Overwatch roster. Update: Moon map confirmed via this official walkthrough video! Still no sign of Hammond, though. According to Overwatch lore, the Horizon Lunar Colony is a research station where human scientists once studied genetically enhanced gorillas. Then the gorillas rose up and killed the humans in your typical Natural Satellite of the Apes situation. Winston wasn't having any of it, so he built a rocket and escaped to Earth, where his story with Overwatch began. Nobody has been particularly eager to go up there and check on the killer gorillas since then. This new image shows the current state of the Horizon Lunar Colony. If it's indicative of a final map design, it would be wildly different from any other Overwatch map we've played so far - look at all those claustrophobic corridors! The same map image also shows up near the control point on Lijiang Tower's Control Center, as discovered by Reddit user ZombieWithEbola (you can't make these user names up, folks). If we're going to get to play through any part of the Horizon Lunar Colony, though, it's going to be the Observatory. For one, it would be a big, open space for Pharah and company to get some play. It also seems to be the site of the airlock breach that precipitated the rise of the apes. Most importantly, it hosted this memorable scene from Winston's origin story. "I don't know why we ever thought it was a good idea to have smaller test subjects, I completely regret it," one of the Horizon Lunar Colony scientists writes in a pre-ape-rampage message. This is in reference to one subject named Hammond going missing for a week. An earlier message mentions strange sounds in the colony's ventilation system, even after several troublesome gorillas were confined to their quarters. If the researchers decided to branch out from experimenting on gorillas, it would make sense for them to stick to apes. Maybe Hammond is a chimp? He wouldn't have the same brawny bulk as the gorillas, but he'd definitely be nimble enough to treat the ventilation system like a jungle gym. Going back to that map image, Winston and Hammond are the only two test subjects "not found" by the colony's tracking system. Winston is hanging out with Tracer and the gang on Earth… so where's Hammond? A small, super-mobile hero would be an interesting addition to the Overwatch roster, though it would be cool if Blizzard could work out some way to make him a Defense hero. Ana, Sombra, and Orisa have already added new post-release options for Support, Offense, and Tank players. In any case, "killer chimp" does have a nice ring to it. If you're still not sure who to play as in the current roster, check out our guide for which Overwatch hero is right for you.